I hoard remnants--even though I don't sew. When is enough enough? I did discover that one long curtain panel fits a picnic table perfectly. Tell me what projects are waiting to be made from your pile! I have some wonderful bright vintage cotton sheets - still in their wrappings when I bought them! They are as sturdy as iron, washed and ready to be made into some sweet summer nighties for our girl ... I keep putting it off because there is plenty of 'fabric' so I don't have to rush to make them before she outgrows the piece of fabric ... and they are new but vintage already ... I best get to it! I do the same thing, but I do sew when I find time and inspiration. However, I am notorious for using old curtains as throws for picnics or creating teepees with a few long sticks of wild cane. I also love to find old napkins, handkercheifs and doilies to use here and there -- they can be had for a nickel or dime at the thrift store or a yard sale, and add such beauty in a simple way. What a great idea for a curtain panel! I've been picking up assorted napkins, window treatments, pillowcases, and a shower curtain in the Shabby Chic line at Target when they are 75% off. I love those fabrics! I have plans to cut them up and turn them into quilts for my daughters room. I think I probably have enough fabric to get going on that project now. Anna, at Pleasant View Schoolhouse, has been providing lots of inspiration and how to on scrap quilting on her blog. I'm working on some framed letters to spell out my daughter's name, Eleanor. I bought some cheap white frames at Goodwill and am using some old fabric from my mother as well as some old onesies to make the letters. I use the sewing machine to create an embroidered look. I've been wanting to hang some letters for her name for a while now, but couldn't afford the finished letters you see in stores--the framed letters are actually turning out better than wooden ones. So far I've got the first two letters done! I have done the opposite--used table cloths for curtains. They work perfect for floor length curtains and the best part? No sewing. :) I got cute little clips and hung them up that way. I have had them like that for almost 6 months now and still love them. that would also make a perfect stage prop! Put a tension rod through it and hang it in a doorway! Our kids love putting on "shows" and coming out "back stage". I have a table cloth that no longer fits any of my tables. It's a nice cotton linen weave, so I'm just waiting for the right inspiration to use it for something else. Love flat sheets for curtains...just made one for my husband's office. I have 3 pairs of my boy's jeans waiting to be full-knee patched with old blue jeans. A stack of clothing that my oldest daughter has outgrown and outworn, but will make some great upcycled clothing for my toddler. A stack of my husband's t-shirts waiting to be made into diapers (although I doubt I'll get around to it before my toddler's potty trained!) . Queen-sized flat sheets being made into bean-bag chairs...the 'beans' were free ground EPS from a local plastics company. What a smart idea! I'm currently transforming an odd flat sheet into "floor pillow" covers for the boys, odd remnants of fabric to recover smaller pillows (a la Nester) and some chocolate gingham to make curtain panels for my bedroom. I have a few projects waiting. Number 1 would be to make some embellished prefold diapers with the organic bamboo velor I have. I also have some super cute fabric to make PJ pants and embellished T-shirts for Nate and some other little ones. I have kids pants with holes or bad stains waiting to be made into a scrap quilt. I over-promised and under-delivered at Christmas! I know, I need to simplify! Anyway, I'm finishing purses for my female family members. Next up, aprons for my coworkers' birthdays this year. Pajama pants from an absolutely gorgeous set of vintage sheets with fancy-schmancy trim -- no hemming for me! Plus a matching pair for my 5-year-old daughter, who is ecstatic about the idea! I have the sweetest little makeup table/drawer/dresser...waiting to be painted...I am scared to touch it..so it sits in my garage:(! My house is just chock full of stash items waiting to be made into fabulous stuff! When I find something like this -- using one thing as another thing with no sewing, spray painting, or refinishing involved -- I just rejoice, and so should you! I have a bunch of fabric. Most of it is store-remnant, like the coordinating fabric that's supposed to be a skirt for my oldest. I do have flannel blankets that I hope to repurpose for diapers, mama cloth, and wipes. I have men's shirts that are supposed to be dresses for the girls. I just recovered my kitchen chairs from an odd panel I had - the fabric is thick upholstery, so nice and sturdy for chairs. Wow! You have a thrifty, creative bunch of readers, Meredith! All of these comments and neat ideas make me feel a little bit like a failure....my two year old, who was a preemie, has been "on the go" and into everything, non-stop, for the past year or so, so much so that I literally cannot get ANYTHING done in a day. I am growing weary of never feeling like I get any projects accomplished, and will be glad when this stage with her ends! She has absolutely been the hardest out of our 5 kids. But my husband always says she will probably be our best worker someday, and to just hold on and wait it out! I don't sew either. At least not yet. We'll see. I almost bought a curtain panel to use as a tablecloth at a thrift store last week but the trim on it was pretty hideous and I decided I didn't want it badly enough to re-work that. That's a GREAT idea! I have a number of those panels myself. I'm going to hang one on the shelving unit that holds the kids toy bins. I recently got a small bundle of great fabric remnants at a thrift store for 25 cents! I plan to sew them to make decorative throw pillows for our bed. Oh yes, I also used an extra curtain panel to recover the cushion on a rocking chair for my baby's room. Now it matches! I often find 'lace' curtain panels at garage sales or the thrift store. I buy these for the dress up box in my day care. The children love them. The girls are often brides, the boys make tents, and they use them for blankets with they play house. So many uses for one piece of fabric. Once my sweet husband brought me a huge curtain that he got from a dumpster at his job. An attorney had moved out of the building and when they cleaned his office they threw this huge curtain away. It was lined with linen. The other fabric was beautiful blues. There were 10 or more yards of fabric. I used the fabric to make covers for both my travel trailer, my sister's travel trailer, and the windows of the trailers. I also had enough of the fabric to make some pillow covers. The linen fabric was enough to back 2 quilts and with left overs. I have five ~stuffed full~ totes of vintage fabric and linens.Trouble is, I never have the nerve to cut into them.We are moving again so maybe this time some curtains can be made for the new house. Thanks for this post! You inspired me to use up some plain remnants for fabric painting with the kiddo! Not long after we moved into this house, I found i needed a curtain panel across a doorway between the laundry room and bathroom. An oblong tablecloth fit the bill perfectly! And then used two clearance-price tablecloths, cut in half and hemmed to hang as curtains in the master bedroom. Perfect! I use an oblong Batenburg Lace tablecloth as a center panel curtain, between two toile curtains on a wide bedroom window . I have lots of fabric waiting for my creativity . I am going to try to recover some pleated fabric shades with some of my fabric. If any one knows of instructions for how to do this I would love a link ! I am trying to use what I have by renewing or repurposing it. 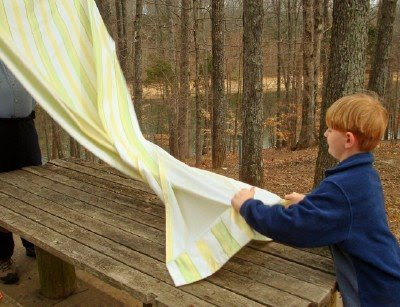 I'll use anything for a tablecloth or in reverse, a tablecloth for a curtain if necessary. On the top of my pile? 4. 3 bolts from Wal-Mart's fabric dept. closeout to slipcover old headboard and make curtain panels. WalMart closing out anything that "needs cutting" (yardage, trim) in favor of enlarged electronics displays. Good-bye frugal resource!! I have all the receiving blankets for my two children when they were infants. I plan on making them into a quilt just like my mother did for me...but there never seems to be enough time! I also have some hankerchiefs in the works to make an apron, and an old dress shirt of my husband's that I am wanting to make into a sun dress for my daughter. Thanks for the peace your blog gives me every day! wow...so many wonderful ideas and projects you all are doing....and i am getting some wonderful ideas from them all!! I desperately am needing a new apron...i think i will plunder through the hall closet and see what looks good!!! I have some fleece that I bought for lounge pants. I never got around to making them. It's now in the 70s and 80s here. I overbought on fabric for the bedpockets I made for my nieces for Christmas. I've been meaning to use some of it for lavender sachets for the closet, but again, I haven't gotten around to it. Sewing still intimidates me. Among my stash I have four fabric squares, partially hemmed, that started out to be curtains for our remodeled kitchen in second married house but didn't get done after baby was born, have been used as table toppers since then...maybe will make it to windows in now fourth residence since married. After downsizing this move I am really into the "container rule" for storage and still sorting and winnowing. Meredith - I can hardly believe I'm writing you when I have packing to do - and the plane leaves in 3 hours - insane, I know. YES ! YES ! YES ! Can't tell you how many times I've made bright curtain panels from yard sales or thrift shops or cloth shower curtains (which have a beautiful texture and quality) into tablecloths and make-shift decor beautifuls! I also use wine glasses as votive candle holders too - line them up for a table scape - easy does it! I'm one to tuck fringed edges too - Love these ideas - keep them coming! :) this is so "Sound of Music" of you! I'm sure Julie Andrews would be proud. You all are SO creative! Pajama pants from vintage sheets--that alone is enough to make me want to sew! Julie, I don't know why I hadn't thought to use the panel as a stage curtain. Easy and brilliant! Thank you so much for contributing your ideas! WOW! I never would have thought this one up on my own...you have the BEST ideas! And I am going to look at curtains in a whole new way forevermore. My husband is in the Easter play at church - I'm using a big scrap of free fabric for the main part of his costume and a thrifted silky duvet cover for the diagonal wrap thingy (!). I'm also tearing apart thrifted dresses and jeans to create skirts for my daughter. SEW much for spare time! I made three (big, medium, and small) snowmen from and antique, all white quilt that had a hole in the middle. They are quite big. I sewed them up and stuffed with batting. They sit on my rocking chair on my porch during the winter months. Very simple, yet elegant! Thanks for all the ideas you share and invite to your site. Very inspiring. Totally cool! Followed your link from the inspired nest and really enjoyed your blog space. I totally figured the opposite out as well--have been hemming and hawing about spending money on fabric for some very tall windows---found 106"x84" damask tablecloths on clearance and Target--so I got extrawide 96" long panels for $6.24 each---bought 5 and turned my $300 project into a $30 one---they look AWESOME! I've got plenty of odd curtain panels around. I can't resist (or get rid of them).